At 16, the Monegasque Charles Leclerc has just completed his final season of karting with the significant result of KZ World Vice-Champion its first year in 125cc gearbox. Winner of the Academy Trophy in 2011 and World Vice-Champion U18 in 2012, his rise has been meteoric for a driver who does not spend much time training on the track. 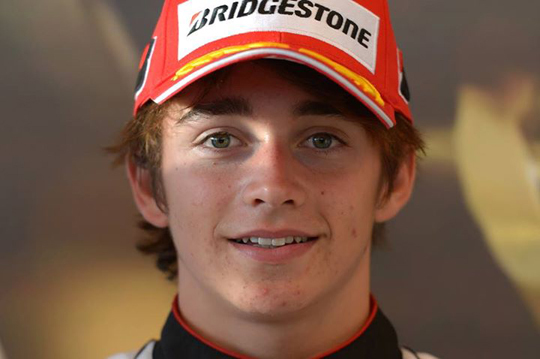 "Naturally I started in France in Minikart then Minime and Cadet before making my debut in KF3. The 2011 year marked a turning point in my career. I focused on an international programme including the CIK-FIA Academy Trophy. This competition takes place with identical karts and gave me a lot, especially as I finished first! But I also gained confidence. I also won the KF3 World Cup at Sarno, one of my best memories. "The following year, I moved up to KF2, with the title of European Vice-Champion and a 5th place at the World Cup. But I wanted to participate in the U18 World Championship in parallel as a sequel to the Academy Trophy, because it is very useful to fight on equal terms. 2nd place at this level is a good result. I knew I would soon move to cars, but I took advantage of the opportunity to pursue karting for one more season. 125cc gearbox is a good learning experience before going to cars and I was able to compete with the biggest names in karting like Davide Fore and Marco Ardigo who made me dream when I was younger. I even took 2nd place at Varennes in the KZ World Championship behind Max Verstappen, a great satisfaction for a rookie like me! "Numerous clashes with Max Verstappen track gave me additional experience that I am enjoying now. He is a formidable rival and competing with him builds character! I am currently preparing for Formula Renault 2.0 in 2014. Of course, the experience of competing in karts is irreplaceable, even if though the car world is very different. Karting has the advantage of driving a lot, you learn to manage stress and stay calm in the paddock, to put pressure on your opponents, and when you're in a well-structured team like ART GP, working constantly on data acquisition, which is very important in cars. "To succeed in karting, you must have good associates. The family of course has a major role, as do the teams. All of the teams which I found myself in since Minikart helped me progress and I thank them because it is thanks to them that I can continue my career. Then being identified and supported by All Road Management and Nicolas Todt remains a fundamental point. I guess all the drivers who leave karting have a touch of nostalgia, but the lure of the new challenges we face is the strongest motivation."